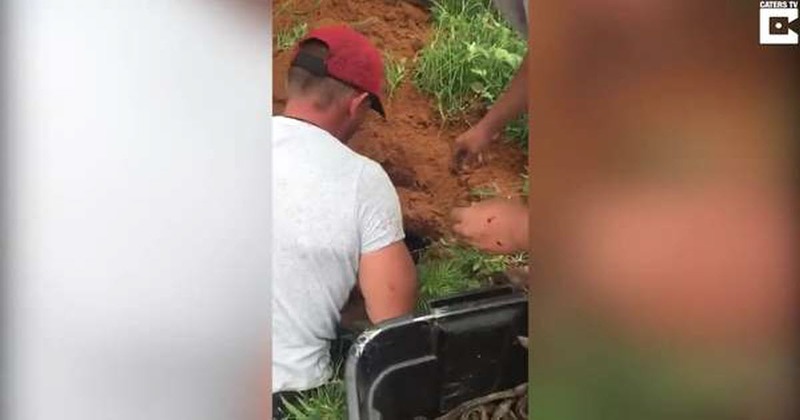 A fearless snake catcher has been filmed sticking his hand into an underground nest and pulling out dozens of wriggling baby pythons – with the rescue leaving him bleeding in the process. Cor Viljoen, 39, was called by a farmer to move the nest after dozens of hatched eggshells were found for fear of the snakes being killed by scared workers. Footage shows Cor, who works at Klein Kariba resort in Bala-Bala, South Africa, kneeling by the sandy lair, sticking his hand into the deep hole and pulling out handfuls of the slithering serpents. The safari guide claimed that while he hadn’t being expecting so many snakes, he wasn’t scared as they felt like ‘handfuls of spaghetti’ – but had the check the five-metre mother was not home first.